Emma Bridgewater is a Staffordshire designer who operates a famously successful pottery in Stoke-on-Trent in the midst of the district that the English refer to as "the Potteries." The wares are designed not as art pieces but as working dishes for the everyday kitchen. This does not mean that they sacrifice design pizzazz, though. Emma's famous Polka Dot pattern has achieved legendary status and her husband Matthew's designs featuring dogs are both realistic and artistically striking. Ann Marie sells a wide range of Emma Bridgewater pottery From graphic black text on cream pottery to exuberant florals and delightful children's designs, the Emma Bridgewater line features designs both traditional and innovative. Her Toast and Marmalade Pattern is known worldwide and is one of her original patterns. 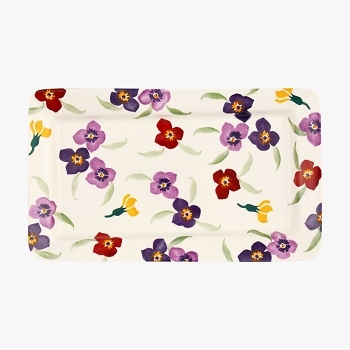 Order today and enjoy your Emma Bridgewater masterpieces!